Chidi (William Jackson Harper) and Eleanor (Kristen Bell) are still pals as the third season of The Good Place gets underway. The Good Place is also unusual in that its first and second seasons were practically different shows. In the first, Eleanor Shellstrop (Kristen Bell) thought she was in heaven. In its second, she knew she wasn't. Eleanor and her friends had realized that they weren't in heaven; they were in hell. And in the third season, the entire situation has been reset so that they are back on Earth as living humans. Now, the idea is to see what would have happened if they hadn't died at all — if Michael (Ted Danson), now a reformed demon (look, it's a long story) had saved them and left them to try to become good on their own. The season three premiere is structurally tricky. We begin with Michael's initial decision to visit Earth and prevent four deaths. To get there, he must pass by a guard, played by Mike O'Malley, who's unimpressed even after Michael tells him the wondrous tale of the place he's going, where one restaurant can be both a Pizza Hut and a Taco Bell. After that opening, the episode jumps and loops in time to tell a story that is essentially this: after the four friends — Eleanor, Chidi (William Jackson Harper), Tahani (Jameela Jamil) and Jason (Manny Jacinto) were saved from death by Michael, they all earnestly used those near-death experiences, for about a year, to try to live better lives. But having seen little reward, and without the right support, they all backslid. So Michael dropped in on them again to nudge them toward each other, believing that they needed each other to improve. He figured that it wasn't, in fact, the fear of going to hell that made them better when they were dead, but the bonds that developed between them. This begins with recreating the bond between Eleanor and Chidi. Michael — in the form of a friendly (and somehow familiar-looking) bartender — manages to influence Eleanor such that she discovers Chidi's lectures on YouTube and goes to Australia to meet him and study with him. As it turns out, she still wants to be good, even after all the struggling. Their work together leads to a broader study, and that's where Chidi recruits Tahani and Jason. Getting the group back together (and revealing a last-minute addition that's a bit of a fly in the ointment, to say the least) is the task of this first episode. It's certainly not as hard a turn as the shift from season one to season two. But the move to real life reflects the same restlessness — and perhaps the same fear of stagnation in a show that by definition limits how much characters' paths can change. 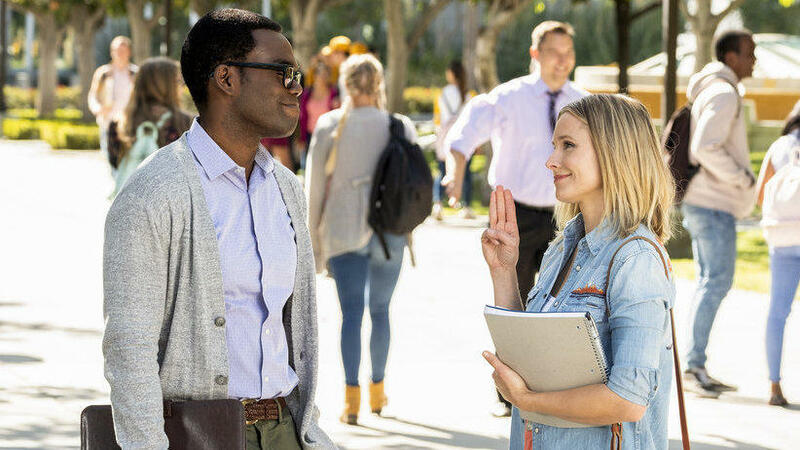 The writers have talked about how the initial premise of Eleanor concealing her mistaken presence in what she believed to be the "good place" lasted only seven episodes. The idea that it was the good place at all only lasted 13. Then Michael was an antagonist, then he was a friend. Things move fast in this story, which is partly a salute to the power of 13-episode seasons rather than the traditional broadcast schedule of 22 or 23. The writers move through ideas and frameworks for ethical conversations, not just through plot twists. And that pays off. For instance, one of the loveliest parts of the premiere is the study of whether Eleanor and Chidi could possibly have been friends outside of the bizarre circumstances in which they were brought together in order to participate in each other's misery. As it turns out, the difference between bonding in hell and bonding on earth, for both of them, is kindness. In heaven, Eleanor grudgingly accepted Chidi's help at the risk of eternal damnation, and he was forced to help her out of a sense of obligation and guilt. But on earth, Eleanor seeks help humbly, by asking for it, and Chidi gives it kindly — "I'm a teacher," he says, "it's my job." Yes, they've both been nudged by Michael, but just as he hoped, they are not acting out of the fear of hell or the desire for "moral desert" (in short, a reward) at this point. They are acting out of a desire to be good, and it causes them to be gentler, kinder, and more grateful. So the question raised by this experiment that Michael talked the judge (Maya Rudolph) into supporting is not only whether they can improve without the threat of the bad place, but whether they improve more gently, more generously, more fully. If you've heard the actors and writers speak about the show on its outstanding official podcast, you know that everything on The Good Place is about something, and everything has been carefully considered. The show does not tread water. Creator Michael Schur has said that after his previous show, the much-admired Parks and Recreation, ended, NBC gave him great latitude, bordering on a blank check, to make what he wanted. And given that latitude, he chose to make a comedy that has explained real concepts of philosophy like moral particularism and utilitarianism. When it quotes Kant, or considers the trolley problem, or reveals that philanthropy motivated by competitive image-building is not goodness? The show is exploring how we behave. Not just in edge cases or high-profile situations, but day to day. And as it goes, it has crept closer, in some ways, to real life. Eleanor began as a woman stranded in a science-fiction story, in an afterlife with unlimited frozen yogurt and clowns everywhere. But now, she's an Arizona woman — a real "trashbag," she tells Chidi — who had a terrifying near-death experience and devoted herself, as so many of us have, to self-improvement. And then she found that no matter how good she was, the world around her did not treat her better. Eleanor was honest about having hit a parked car, and in return, she was sued by someone who was trying to take advantage. She came clean with her friends about the bad things she'd done, and they abandoned her. For all its whimsy, for all its food puns, for all its dance crews and genuinely great jokes and surprising deployment of Ted Danson as a physical comedian, for its genius writers and stupendous cast and silly effects, The Good Place turns on sensations that are deeply, painfully real: Who wants to be the last fool grasping at decency? Nobody else seems to care about it, so why is it up to me? There's no question where the show comes down on the answers to these questions, but there's also no question that it has great sympathy for people who ask them. And this structure to the season also gives us a chance to see our old friends on Team Cockroach in different environments. Jason leads a new dance crew that seems to be pretty good, for instance, only to be disqualified for too many dancers on the stage — which is the most Jason way to lose a competition ever. (Except for the time everyone is disqualified for brawling.) Chidi meets a lovely neuroscientist named Simone (Kirby Howell-Baptiste, a terrific addition) who helps him get his thesis on track, and he has to figure out how and whether to court her. And Tahani earnestly tries to become a spiritual person, wandering away from the limelight ... at least for a while. It has taken a while for both of the previous two seasons to come fully into focus with regard to what they're really about. This one will probably be the same. But The Good Place retains its creative strengths in the premiere, including its boundless curiosity about how people behave and why they do it. It remains remarkable television.